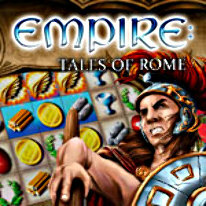 In Empire: Tales of Rome it is your task to found a new city under the protection of the gods! A dispute between the mighty gods, Jupiter, Juno, Neptune and Mars, the god of war comes to a temporary and tenuous conclusion. At the center of this bet? You! Using all of your match-3 skills, it's up to you to construct a gorgeous city in tribute to and protected by the gods themselves. Win bonus games and decrease the costs of building materials, win trophies for completing goals, collect resources and lay the goundwork for magnificent buildings. Help shape an economy and soon your great city will rise to honor the gods! Are you up to the challenge of the great gods of Rome? -Bonus rockets that will shock you with their "big boom"